Not everybody wants turkey for Christmas dinner - these Christmas Fish Recipes will give you some ideas for Christmas breakfast, Christmas Eve dinners and Christmas Day lunch. Some cultures make Christmas a 'Fish Fest' starting with traditional Christmas Eve meals. 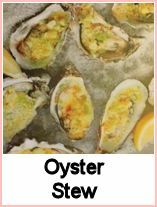 Oyster stew is traditional in Scandanavia, Italy approaches Christmas in the same way as 'fish on Friday' having 'Seven Fish' on Christmas Eve, Eastern European countries like to serve Carp. These Christmas fish recipes will give pescatarians some ideas too. I love smoked salmon with scrambled egg for Christmas Day breakfast. We've done it for years as a family tradition because dinner is going to be hours away and we need something to keep us going and soak up the pre-dinner drinks that seem to be inevitable whilst cooking a large meal for a crowd - I blame my chef's assistants for leading me off the straight and narrow ;-) Harvey Wallbangers all the way! 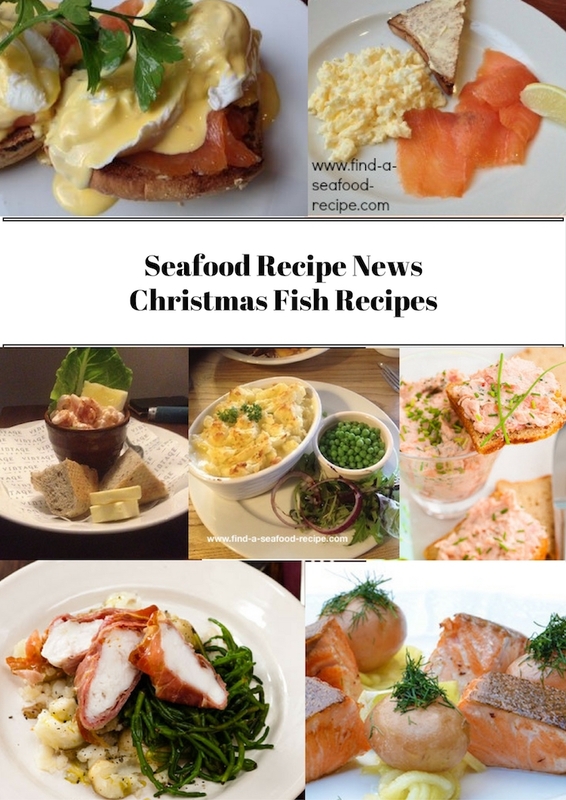 There's shrimp cocktail or smoked salmon pate for a Christmas appetizer, fish pie for a prepare ahead meal and much more in this issue. 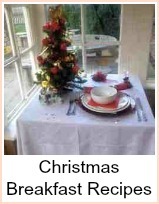 So this issue will be two Christmas breakfasts, two Christmas appetizers, a Christmas Eve fish pie and two Pescatarian Christmas fish recipes for the main meal. 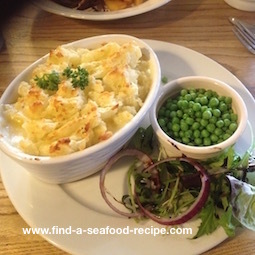 Please do post in the comments at the bottom for any ideas you have - there are so many Christmas meal plans available for meat eaters in the way of 'great recipes' but for pescatarians, not so many Christmas fish recipes. This is my all time favourite Christmas Day breakfast - just enough to keep me going through the day until dinner is cooked which is normally sometime in the afternoon. I have such happy memories of Christmas mornings with my son and every time I have scrambled egg with smoked salmon, I'm transported back - he's continued the tradition of 'special' breakfasts being smoked salmon in his own home. 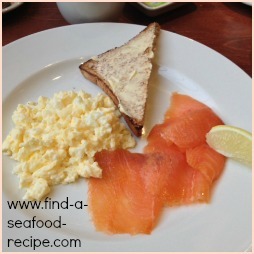 Scrambled Egg with Smoked Salmon click on the link here to get step by step photo instructions for making the perfect scrambled egg and timings for assembling the meal. 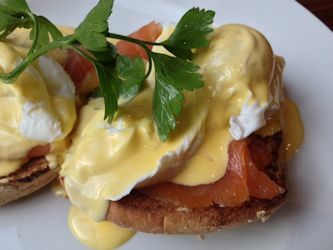 Eggs Royale is one of the most luxurious smoked salmon dishes which is just perfect for breakfast. It's a substantial meal comprising toasted English muffin, smoked salmon, poached egg all topped with hollandaise sauce. If you have non-fish eaters, you can substitute a slice of cooked ham and it will then be Eggs Benedict. There are step by step photos showing you how to make the perfect poached eggs. If you're cooking for a crowd, then this will be the game changer, it's how chefs prepare for quantity. A very traditional Shrimp Cocktail is an ideal appetizer for Christmas Dinner. You can prepare them in advance, just assembling the ingredients into serving dishes at the last minute. It's important to feel as though you have things under control when you're dealing with a celebration meal and by having stuff in the refrigerator you'll feel that you've got some breathing space. 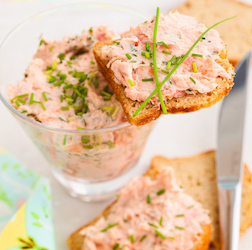 This Seafood Pate recipe is very versatile. 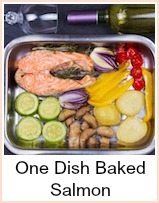 The recipe uses smoked mackerel which is an inexpensive and tasty fish. It's also very high in the Omega oils that are so good for you. I have used smoked salmon offcuts which is a more luxurious fish - you could also use smoked trout if you can get some. The quantities will be roughly the same. 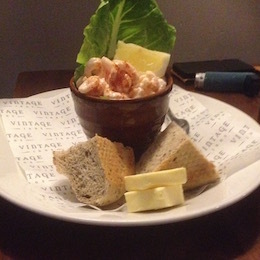 It's another seafood appetizer that you can prepare well in advance. Keep it in a poly box in the refrigerator and you could make it a day or two ahead. You could also serve it for Christmas Breakfast with hot buttered toast. A Fishermans Pie is a great meal for Christmas Eve. It's quite traditional to serve fish on Christmas Eve in some countries. It's quick to cook and easy to digest. You can make this pie in one big dish or individual dishes, but it's another meal that you can prepare ahead. Cook your fish and make the sauce, then put it into your baking dish. Cook and mash the potatoes. When you're ready to cook, just tip the potato on top, drizzle with some oil and into the oven. Some frozen petit pois are perfect with this, but you might like to have green beans or calabrese/broccoli. 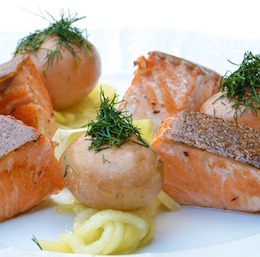 Salmon is often considered to be the King of Fish and it's not hard to understand why. It's meaty, a beautiful colour, full of Omega oils that are essential for health, easy to cook and digest. It's also extremely versatile. This simple foolproof method of Poaching Salmon will stand you in good stead for hundreds of meals to come. You can get it all ready well ahead of cooking time. You can cook any size piece of fish with this method, so you could cook individual portions for your pescatarians or a whole salmon that you can make as a centrepiece for your table. 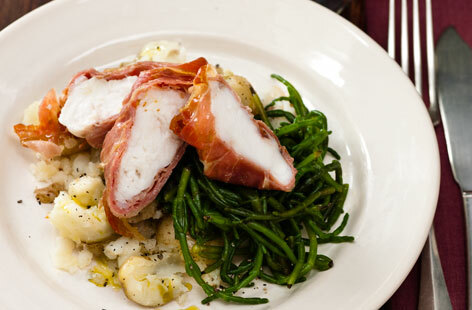 Roasted Monkfish is a perfect example of Christmas Fish Recipes. It is a beautiful white, firm meat. By wrapping it in ham (you can use any thin ham you like) you will protect it from drying out. Not pescatarian of course, because of the ham, but it's a wonderful alternative to turkey for Christmas Day. You can prepare the parcels well ahead, leaving you to put them into a hot oven for 30 minutes or so. The serving suggestion here is for crushed new potatoes and samphire or substitute green beans. You could just as easily serve this with your usual roast accompaniments. There is another recipe for Roasted Monkfish here which is one large piece of fish studded with garlic. It depends what you prefer to do.